I am looking for loving homes for some of my young adult cats. Some are spayed, and some are not. They are all between 2 and 4 years of age. We are located in Braeside Ontario and are looking for a male exotic with full rights for show and possible breeding in the future. What do you have available? sorry, I didn't check my comments. 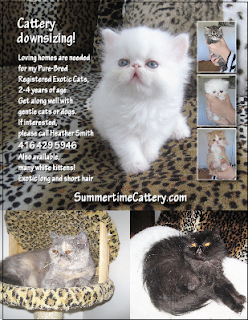 I have litters coming this summer, and always do get show kittens. Over the past 3 months, I had 15 babies, 8 being top show, but I missed your comment. If you are still interested, please email me!